I would really love it when some groups, or universities, on institutes, would set up something resembling this dedicated to a single arXiv-topic. Given our history, Antwerp University might be convinced to do this for math.RA but (a) I’m not going to maintain this on my own and (b) there may very well be a bandwidth problem if such a thing would become successful… (although, from past experiences and attempts I’ve made over the years, this is extremely unlikely for this target-group). So please, if your group has some energy to spare, set-up your own math2.0-network, port it to Google Apps, Knol, Orkut or whatever, and I’d love to join and contribute to it. As to LaTeX-support : this is trivial these days. 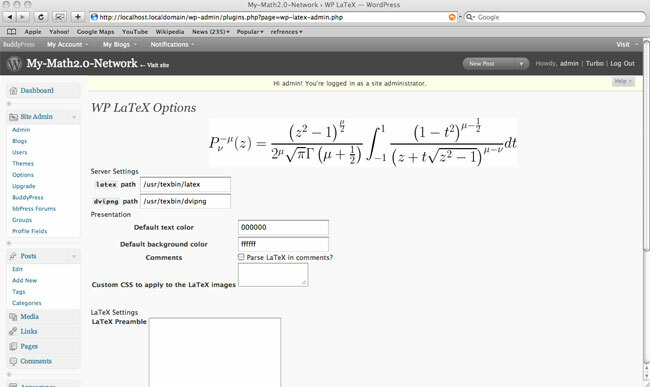 First you need a working LaTeX-system on your virgin macbook. The best way is to download The MacTeX-2008 Distribution at work (it is a huge 1.19Gb download…). Next, install the fauxml-wordpress plugin (that is, download it to YourHome/Downloads and then drag the file faux-ml.php to the Library/WebServer/Documents/wp-content/plugins/ directory. Next, install likewise the WP-LateX plugin following the instructions, go to the configuring page and set the directory for latex and dvipng (if you follow my instructions they should be located at /usr/texbin/latex and /usr/texbin/dvipng), fill in the text color and background color you desire and clip your default latex-documentstyle/includepackages/newcommands section from your latest paper into the LaTeX Preamble window and believe me, you’re done!! !